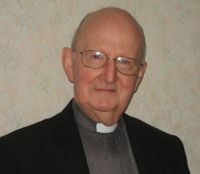 The site for the cathedral was donated by Francis Gore, a Protestant landowner in 1828. 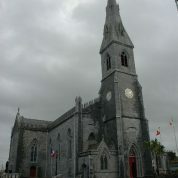 The building was originally intended to serve as the parish church of Ennis. 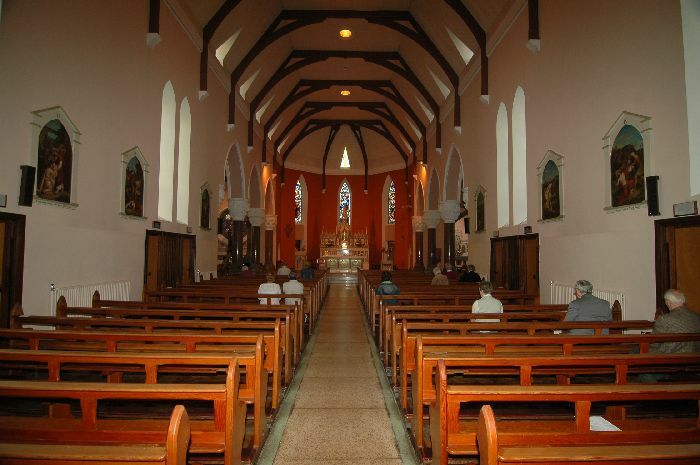 The architect was Dominick Madden who had also designed the cathedrals in Ballina & Tuam. Financial pressure hindered the project which resulted in a suspension of work for three years. 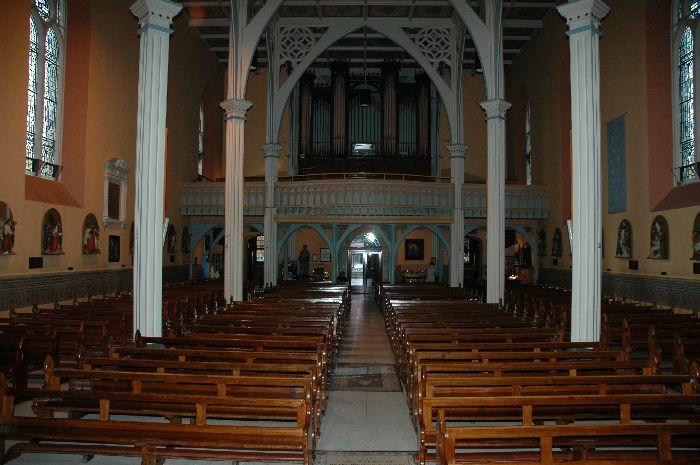 It was not until 1842 that the roof was put on the building and the first Mass was held in the still unfinished building by parish priest, Dean O’Shaughnessy. 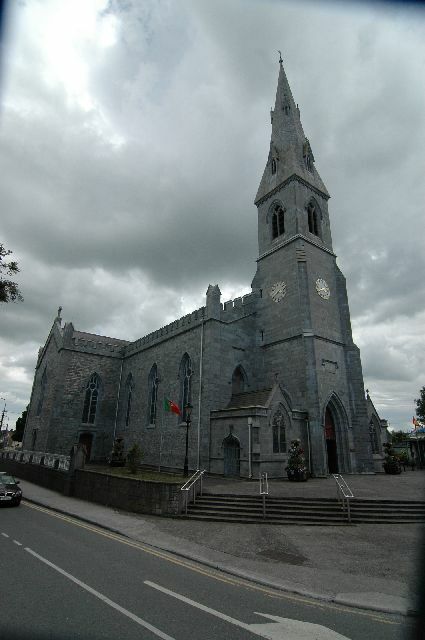 In 1874 the tower and spire were completed and in 1890 Dr Thomas McRedmond was consecrated as the Bishop of Killaloe. 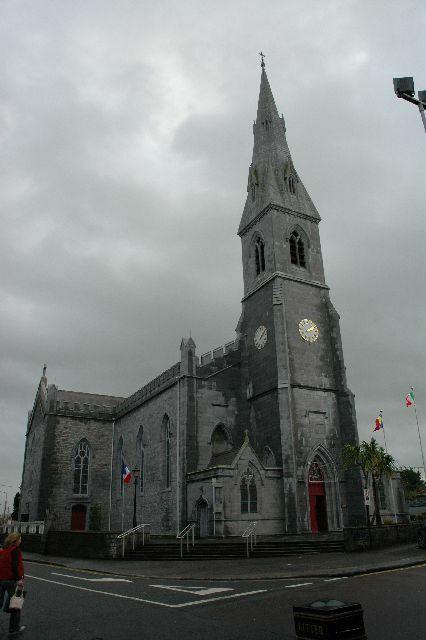 The parish church of SS Peter & Paul was designated as the pro-cathedral of the diocese when the new Bishop decided to make Ennis his home. Major renovations were carried out in 1894 – the construction of the present main entrance and the redecoration of the building. 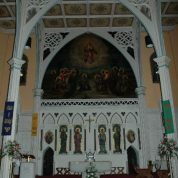 The large painting of the Ascension which dominates the sanctuary (the work of Nagle & Potts) was also installed at this time. 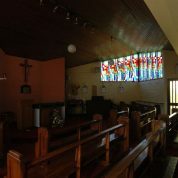 A new sacristy and chapter room were added in the 1930s as were the pipe organ and chapter stalls for the canons. 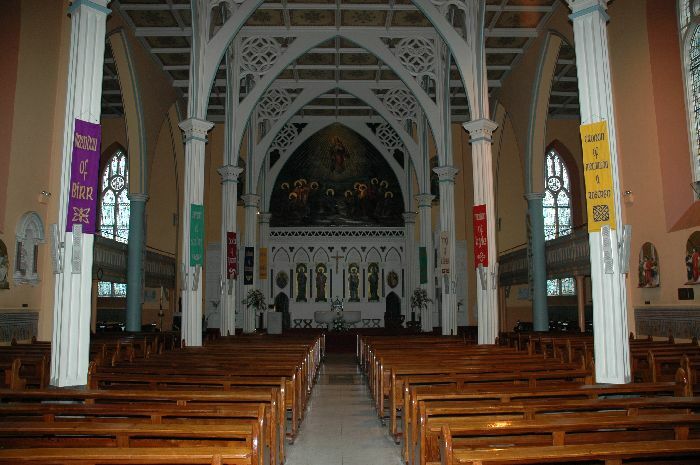 In 1973, work was carried out to bring the building into line with the requirements of the Second Vatican Council. The team involved in the renovation included architect-Andrew Devan; contractors-The Ryan Brothers and artistic advisor-Enda King. 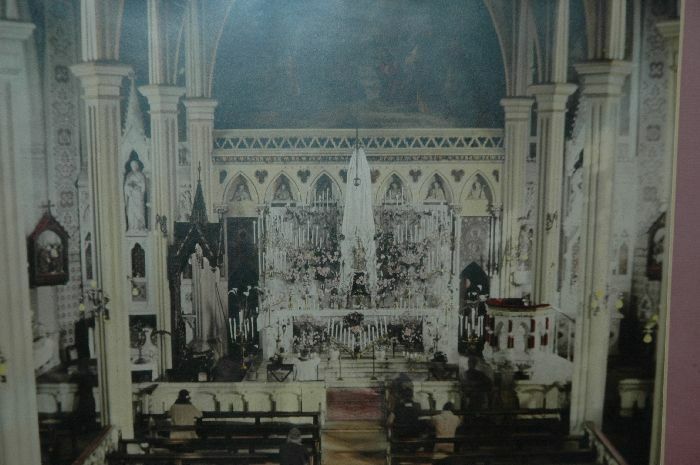 The building was reopened after six months in December 1973. 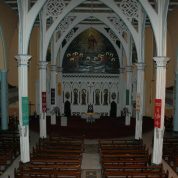 In 1990, 163 years after work on the building began, Bishop Harty named it a cathedral. 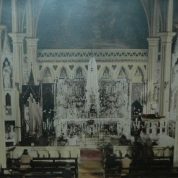 The solemn dedication of the cathedral and the altar took place on 18 November 1990. 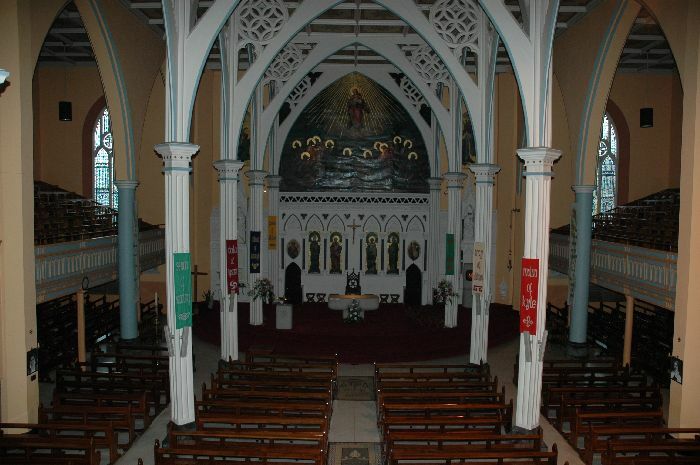 The sanctuary was rebuilt and the building redecorated after a fire at a shrine in the cathedral in October 1995. 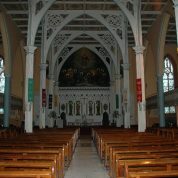 The restoration was celebrated with Solemn Evening Prayer in November 1996. 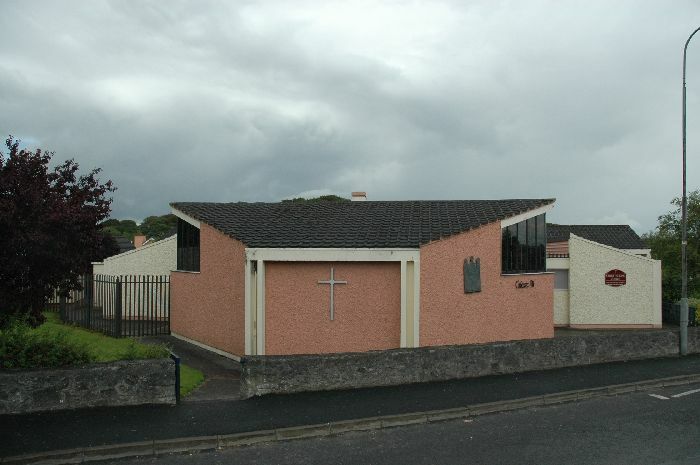 The Church of Christ the King (Críost Rí) that was opened in 1978 to serve the growing population in the Cloughleigh area of the town is one of the smallest churches in the parish. It is unusual in that it is adjoining the local National School. During the week the main part of the building is used as an assembly and general-purpose hall by the school. 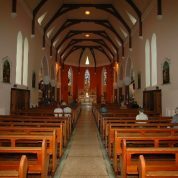 The church, though now inadequate for an area, which has grown beyond all expectations, generates a sense of belonging and togetherness. 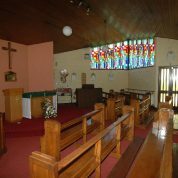 Because of its size there is a greater involvement on the part of the people, a feature that makes the church welcoming. 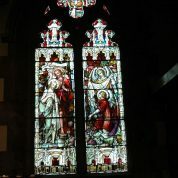 Hands joined in harmony and peace” This stained glass panel which was fitted in 1999 to mark 21 years, has been adopted as the emblem of the community. Four hands of different colours, with two hands clasped in friendship, are symbols for us of the reconciled world, where all people live in peace and harmony. In Cloughleigh, we the people want this to be a sign of our welcome and openness to all. This symbol was used by Bishop Walsh to express forgiveness and friendship, during his Diocesan Pilgrimage of Reconciliation (Advent 1999). 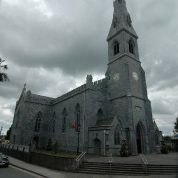 The fifteenth and sixteenth centuries heralded a period of impressive artistic and architectural activity in Ennis, remnants of which can be seen in the old friary today. 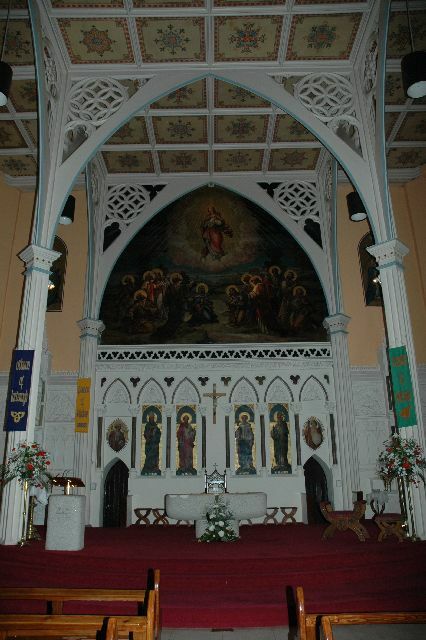 Two altar panels dedicated to St Francis and Christ in pity and a tomb depicting the Crucifixion illustrate a high standard of craftsmanship and influences from England and the Continent. 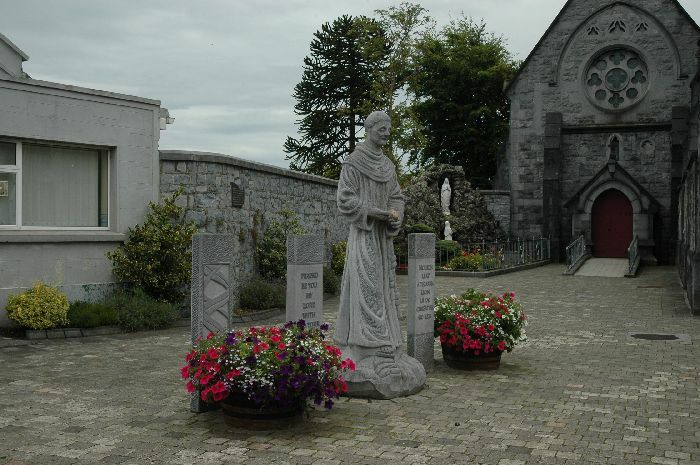 Although the house was suppressed in 1543 the friars remained in the town and operated from houses of refuge at Doolough Lake and Inagh. 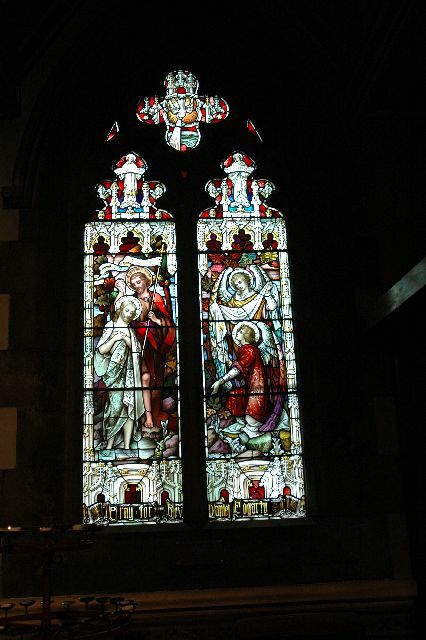 A new chapel was opened in Bow Lane in 1830 and the present friary at Willow Bank House was obtained in 1856. 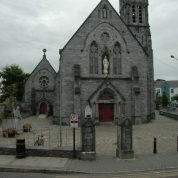 The friary church was designed by local architect William Carroll Jnr. It was estimated that it would cost £6,380 to construct. 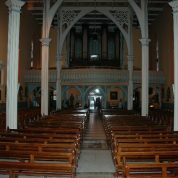 The foundation stone was laid on 14 December 1884 and the church was officially consecrated by Bishop Thomas McRedmond on 11 June 1892. 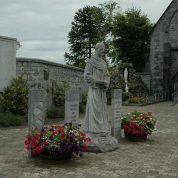 The present friary is the Novitiate house for the Irish and British Provinces of the Franciscans. 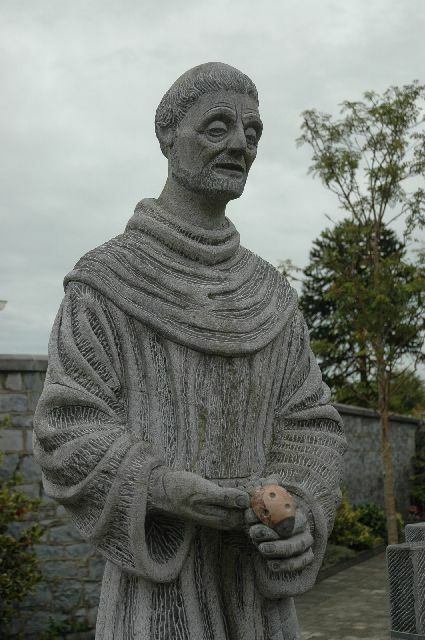 It is here among the people of Ennis that the future generation of Franciscans is being formed. 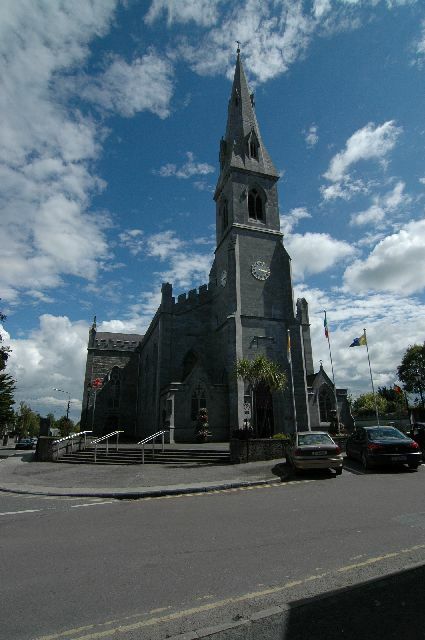 We are proud of our deep connection with the history of Ennis and we strive to continue to serve the people of our Parish and surrounding areas. 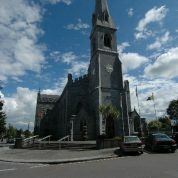 St Joseph’s Church is located on the grounds of St. Joseph’s Hospital in Ennis. 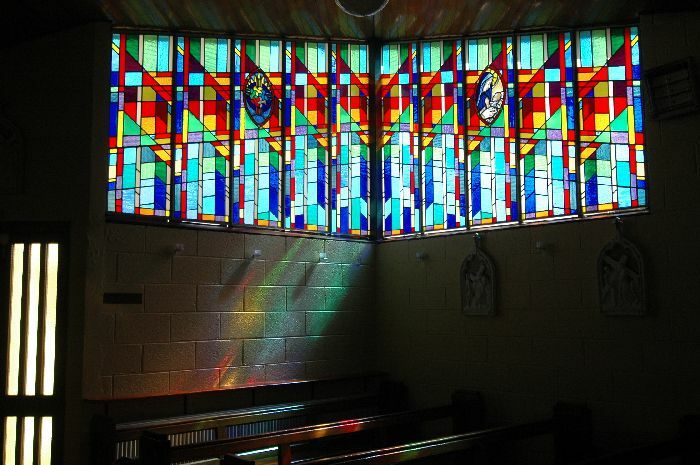 It was designed by Patrick J Sheehan and Associates of Limerick and dedicated in 1972. The C.B.S. 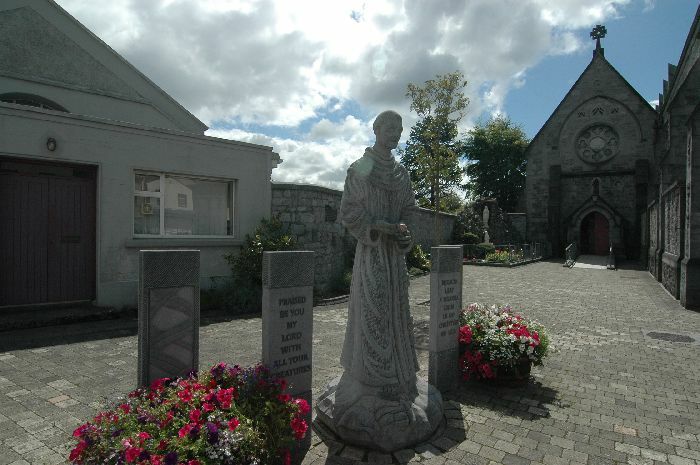 Primary School was founded in 1827 and is the longest cbsestablished primary school in Ennis. The school has a teaching staff of 32 teachers today. Pupils enjoy an extensive playing ground and P.E. hall and a computer room is also at their disposal. Extra curricular activities include hurling, gaelic football, camogie, ladies football and basketball. Children also avail of swimming lessons, german, speech and drama and compete in chess competitions. 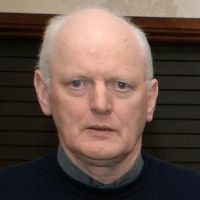 Pupils form quiz teams, participate in the school band and school choir and take part in the Feile Scoildramaiocht for which they were All-Ireland primary champions on a number of occasions. 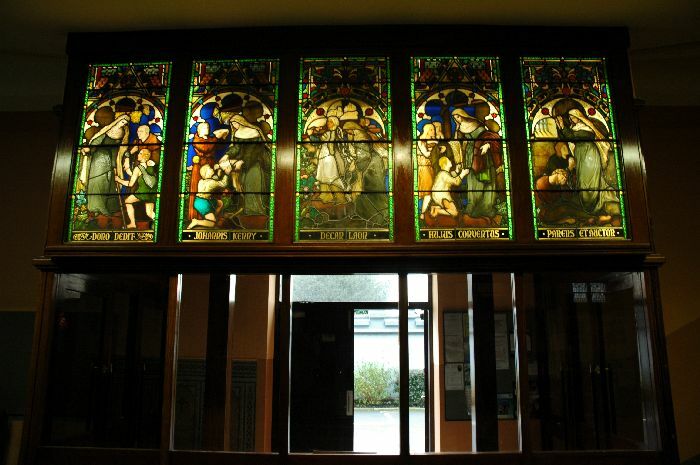 Since 1860 our school has been a centre of innovation in education and excellence in learning and teaching. Today we are a modern vibrant school catering for girls in Ennis and the surrounding area. Following in the Mercy tradition our students receive a balanced, holistic education, developing spiritually, personally and academically. In Coláiste Muire school life is balanced, we succeed in combining academic excellence with an outstanding range of opportunities and extra curricular activities. Our students achieve academic excellence in a caring supportive environment. 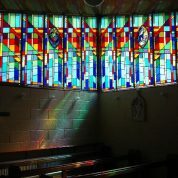 Coláiste Muire is a caring community with a positive, open relationship between staff, students and parents. Life long friendships are forged in Coláiste, students and staff leave but the spirit of Coláiste remains with them forever. Our wish for our students is that each one reaches her full potential and has a happy, fulfilling school life. 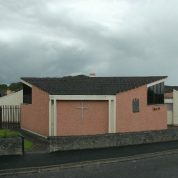 Ennis National School is a co-educational Catholic primary school. Our mission is to create a friendly school where the focus is on supporting children and their learning. The heartbeat of our school is driven by the enthusiasm of our staff and a desire for every pupil to achieve. In Ennis National School, our Catholic ethos is characterised by our caring spirit, our commitment to pupil and teacher learning, and the provision of a wide variety of curricular and extra-curricular opportunities. The school rich in tradition and the qualities of commitment, dedication, professionalism and volunteerism are alive and well. In Ennis National School, we hope that your child will be excited and stimulated by learning, will celebrate success, and will participate in many of our activities including school performances, school choir, school teams, school band, school quizzes, games, art and more. Our school has twenty four mainstream classes and a Reading Class. There are three class groupings of approximately 27 pupils at each class level from Junior Infants to Sixth class. Class teachers are responsible for the children’s welfare and delivery of the curriculum. Work is planned jointly by the three teachers at each class level. By drawing on their individual experiences, knowledge and expertise, class teachers at each class level ensure work is well matched to meet the needs of the children. We are fortunate to have a very dynamic Special Education Team in Ennis National School. The Learning Support, Resource, Language Support teachers and Special Needs Assistants enhance, support, individualise and supplement our pupils’ classroom-based learning. The Reading Class caters for 5th/6th class children in Co. Clare who have a specific Learning Difficulty/dyslexia. There are places for nine students in the class. Students work intensively on literacy and numeracy in the Reading Class, at a level that is appropriate to their needs, and using methods suitable for dyslexia. There is ongoing close liaison, communication and support between staff throughout the school. In this way, we are able to utilise the strengths of a large staff team and enhance the quality of learning and teaching at Ennis National School. Ennis National School has a strong connection with our parents and our local community. We view education as a joint venture, involving everyone – children, parents, staff and the wider community. Our staff co-operate and work exceptionally well with the wider school community in providing opportunities for participation and involvement in rewarding and worthwhile activities. To deliver on this, we work closely with organisations including our Parents Association, Parish Personnel, Town Council Officers, Community Games Association and many local clubs. Bunaíodh Gaelcholáiste an Chláir i 1993 chun oideachas dara-leibhéal a chur ar fáil trí Ghaeilge do dhaltaí i gCo. 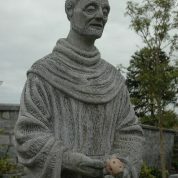 an Chláir. Tá muid faoi stiúr an Choiste Oideachais Ghairme Beatha Chontae an Chláir (V.E.C). Is aonad faoi leith muid ar an suíomh céanna le Colaiste Phobal na hInse. Faoi lathair tá nios mó na 110 daltaí sa choláiste. Bunaíodh Gaelscoil Mhíchíl Cíosóg faoi phatrúntacht easpag Chill Dá Lua i 1983 chun freastal ar an éileamh d’oideachas tré Ghaeilge i gceantar na hInse. Bunscoil comhoideachais, luath thumadh iomlán í Gaelscoil Mhíchíl Cíosóg. 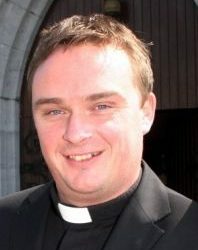 Bhí 234 dalta ar na rollaí i 2009, agus tá an scoil ag fás i gcónaí. 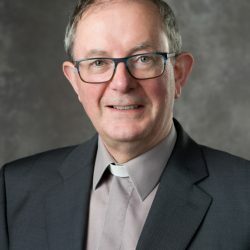 Tá naíonra lonnaithe ar an láthair scoile freisin. Tá 11 oide ar an bhfoireann teagaisc faoi láthair. 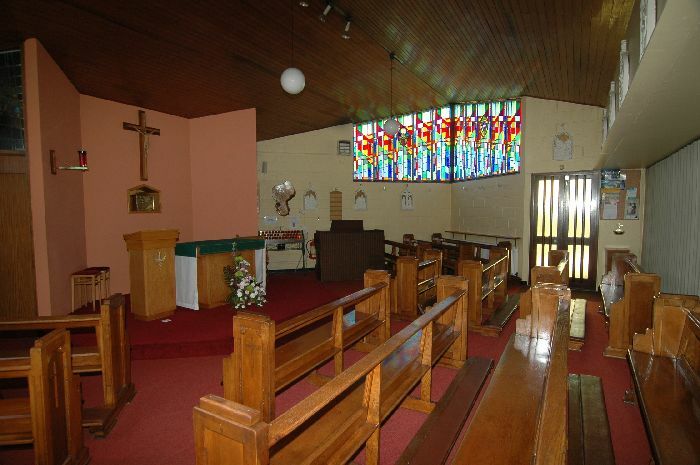 Gaelscoil Mhíchíl Cíosóg was established in 1983 under the patronage of the Bishop of Killaloe to serve the demand for All Irish primary education in the Ennis region. GMC is a co-educational, early total immersion primary school. The gaelscoil had 234 children in 2009 and continues to grow. 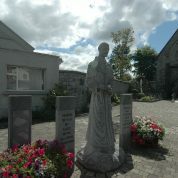 A naíonra (All Irish Pre-school) is also located on the grounds. There are currently 11 teachers on staff. Inspired by the vision of Catherine McAuley, Holy Family School, through a holistic approach, aspires to achieve the full potential of each student, with particular concern for those who are disadvantaged and marginalized. Underpinning this is the Catholic ethos based on truth, justice, tolerance, respect, self-worth and a sense of oneness with the entire Cosmos. We cater for both boys and girls from Junior Infants to First Class. Our philosophy aspires to achieve the full potential of each student, while upholding the values of Truth, Justice and Tolerance, Respect and Self-worth. Based on our aims and objectives, our school engages in a wide range of activities both during and after school, while all subjects in the curriculum are covered to a very high standard. We have a very active Parents council. The committee and Parent Body support us in many ways from fund raising to hands on help with school related projects. The Unit for the Deaf was established in February 1993 to serve the needs of deaf children in Co. Clare and the mid-west region. The children in the unit are taught by a specialist teacher of the deaf assisted by a Special Needs Assistant. The children are taught the full curriculum in the unit except for the Irish language. 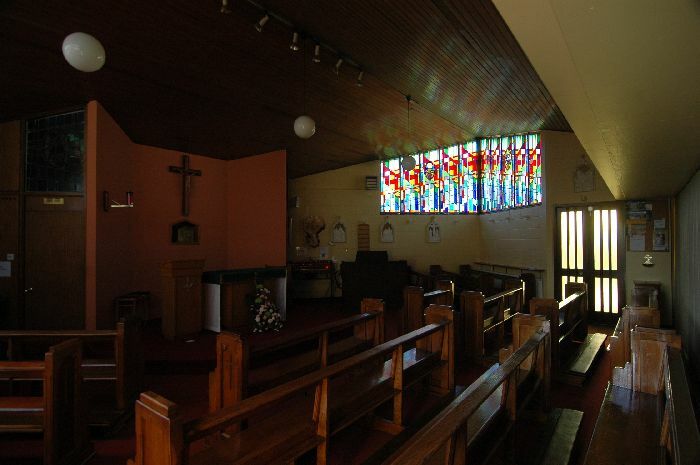 They also integrate with children of a similar age for P.E., hurling, drama, choir, school trips and shows. A Hardwire system is available in the unit for our profoundly deaf students and Radio-Aids are available for our mild, moderate and severely deaf students. The children benefit from educational software, including software teaching ISL.They have access to e-mail and the internet in the classroom in addition to having access to the school computer room. The children avail of the services of a Speech and Language therapist, a visiting Teacher of the Deaf, an Educational Psychologist and an Audiologist on a regular basis. Teaching Staff – 26 Teachers. 9 a.m. – 2.45 p.m. Monday – Friday. Sos: 10.55 a.m. – 11.05 a.m. Lunch: 1.00 p.m. 1.35 p.m.
After School Childcare Facility Available: After School Childcare Facility available daily with pick up from School arranged by Lara, after school facilitator. 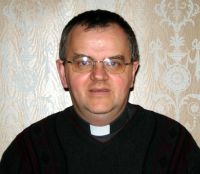 Lara can be contacted on 086 8438888. Montessori School: Run by Ms. Gráinne for the past 17 years. Ms. Gráinne can be contacted 065 68 32875 evenings only. Pupils who meet the criteria will be eligible for free places in the Montessori School and New Pre-School from January, 2010 under the new ECCE Scheme. Education, in the fullest sense, is concerned with the development of the spiritual, intellectual, creative and emotional potential of each person, and Catholic education seeks to achieve the fully human development by modeling itself on the Person of Jesus Christ. 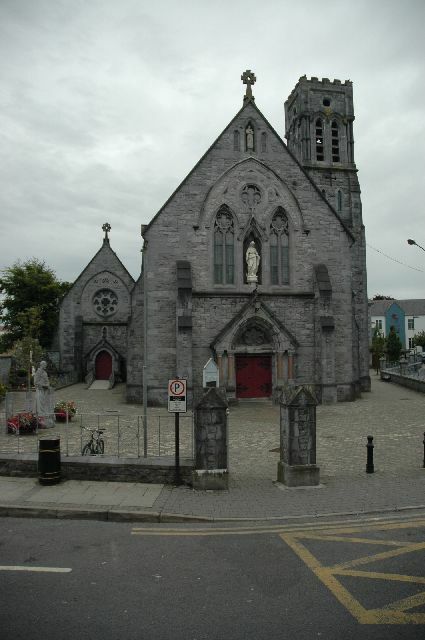 The Christian Brothers’ School in Ennis is a Catholic school and consequently it endeavors to educate its pupils in accordance with the Christian principles outlined in the gospels. 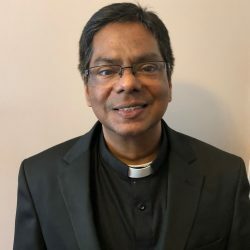 The management, staff, and pupils of the school continually and constantly endeavour to cultivate an atmosphere within the school, which is imbued with the Christian sprit of concern and caring for each other. 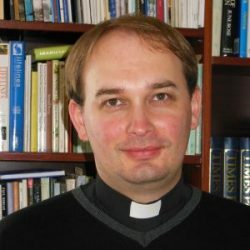 The dignity and worth of each person, from the senior staff member to the junior student, is valued – not because of gift, rank or age – but because they are persons and God’s children. The difficulties of the one are the concerns of all. 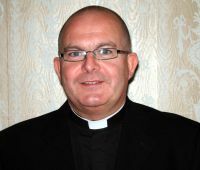 Parents and prospective parents should be fully aware of the Christian character of the Brothers’ School in Ennis. They should feel at ease with the aims, ideals and Christian values of the school, the student feels insecure and consequently the student’s education is hampered. Parents are, after all, the primary educators of their children – hence the necessity for their values and those of the school to be in accord. 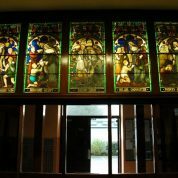 In addition to having small classes with a very high standard of education Scoil Chríost Rí also offers an After School Activities Club, Speech and Drama, Sports, Music, French, Dance, summer camps, etc. School hours are 9 a.m. to 2.40 p.m.
After School Club runs until 4 p.m.
Scoil Chríost Rí is a modern mixed primary school serving Cloughleigh, Hermitage, Lahinch Road, Shanaway Road, Drumcliffe Road, Sandfield, Bishops Court etc. “To Be All That You Can Be”St. Anne’s School is a progressively modern Primary and Secondary School that specialises in providing programmes designed to cater for students with learning difficulties ranging in ages from 4 to 18. The school emphasises that each student should have a well-balanced education along with an appreciation of self and others. The Senior School Caters for children from approximately fourteen to eighteen years of age. Students in the Senior School pursue a variety of programmes which cater for their individual needs, abilities and requirements. Special School for children from 4yrs to 18years. Catering for children with Moderate General Learning Disabilities; Sev/ prof GLD and children with Autistic Spectrum Disorder (ASD) and general learning Disabilities.